The purpose of this study was to review our patients with complications of chronic suppurative otitis media (CSOM) and compare with literature. This retrospective study was performed over 10 years in our tertiary referral university hospital. During this period 4,630 patients with CSOM were admitted to the department and 906 patients underwent a surgery. From the records of the 4,630 patients, 121 patients (2.6%) with complications were identified. Of the 906 CSOM patients that underwent a surgery, 511 had cholesteatoma, and 395 had granulation and/or polyp tissue. Ninety-four of 511 (18.4%) patients with cholesteatoma and 27 of 395 (6.8%) patients with granulation and/or polyp tissue had a complication. Of the 121 complicated CSOM patients, 57 extracranial (47.1%) and 37 intracranial (30.6%). Multiple combined complications were occurred in 27 (22.3%) patients. 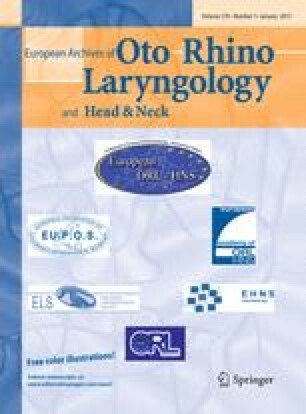 The mastoid abscess was the commonest extracranial complication (28.3%); it was followed by labyrinthitis (9%), facial nerve paralysis (8.4%), and Bezold’s abscess (1.3%). The most common intracranial complication was lateral sinus thrombophlebitis (19.5%), followed by perisigmoid sinus abscess (13.5%), meningitis (9%), brain abscess (6.5%), and extradural abscess (4.5%). Most frequent intraoperative finding of complicated CSOM patients was cholesteatoma, with the exception of patients with facial nerve paralysis. There was no mortality in any of our patients. The additional morbidities were recorded in 25 patients (20.6%). In this study, we emphasize the importance of an accurate and early diagnosis, followed by adequate surgical therapy and a multidisciplinary approach.